If you are looking for personalized clothing this Holiday Season, or in general for any occasion- Zoey's Attic Personalized Gifts has the cutest items for you! If you don't know who they are, Erin Delanty, Creater and Owner launched on 2006. After searching unsuccessfully for out-of-the-ordinary newborn baby tees on-line and listening to friends who were having difficulty finding unique big brother/big sister gear, she decided to make her own line of products. She has every kind of shirt to offer for the kiddos. I have worked with them several times in the past! You can check out my Maternity Tee Review and Birthday Shirt Review here! With Christmas just about here, I was searching for the perfect shirt for Lydia and I found the cutest one! Check out this Personalized Christmas shirt! This shirt features Rudolph The Red Nosed Reindeer and it is a raglan Tshirt. You have the option to change the sleeve colors and personalize the name or change the wording to your liking. Lydia chose red sleeves. It is a youth medium and a tad big but we want it that way so that when I dry it, it shrinks. She will more than likely be able to wear it next Christmas too! Overall, I love the way it looks! It is adorable! This is a digitally printed raglan t-shirt! What does that mean? It means that the fibers of the shirt are actually dyed with eco-friendly water based inks and is printed on a superior quality, super soft t-shirt for long lasting durability. The best t-shirt quality technology available - not an iron on or heat transfer! You can purchase it for $22.50 from sizes ranging from 6 months to a Youth Large. 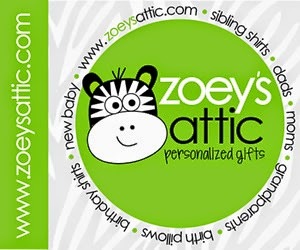 Visit Zoey's Attic Personalized Gifts to see all of the other awesome products they have to offer! Hurry and order in time for Christmas! Orders ship in 1-3 business days! Check them out on their social media below too! You won't regret it! Like this post? Please hover over a photo to Pin to Pinterest or share via one of the buttons below!